(*) Due to flight’s reservations, we need people to sign up for this fieldtrip before June 3rd. NOTE: If you want to participate in this fieldtrip and in a pre-conference field trip, please contact the organizing commitee. The cretaceous Alamor-Lancones basin is located into the Huacabamba deflection, a geographic region which represents the transition between Central to Northern Andes, where the Cordillera change from NW to NE trend. The basin is limited by Triassic metamorphic blocks, the Amotape-Tahuin to the northwest and the Loja Terrane to the Southeast. The Alamor-Lancones basin can be divided into a northwestern quartz-rich domain and a southeastern volcaniclastic domain (Jaillard et al, 1999). The earliest volcanism accompanying rifting is dominated by basaltic pillow lavas and breccias with related VMS deposits formed between 104 to 100 Ma. A second phase of felsic-rich volcanism with ages of 99 to 91 Ma intercalated and overlain by siliciclastic and carbonate sedimentary sequences in northwestern section of the basin (Winter, 2008), at this time the Bramaderos porphyry was deposited (Schutte, 2010) and possible related epithermal vein systems at its borders. The aim of the field trip is go through the basin from the northwest area in the contact between metamorphic rocks and overlain sedimentary western domain toward the southeastern domain where dominated volcanism with porphyry and epithermal deposits are present on the upper sequences and ending in the lower basaltic sequences. Volcaniclastics and sediments near Bramaderos porphyry with strong argillic to phyllic alteration, cutting by late mineral andesitic dykes. 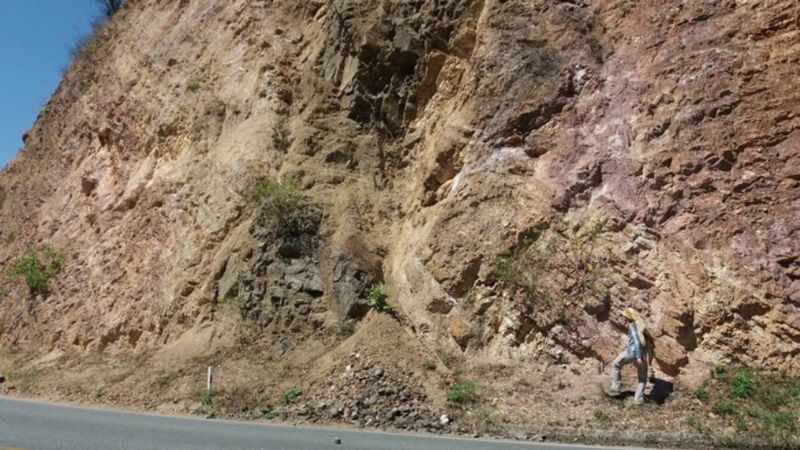 Outcrop in the pan american highway. Photo by Osman Poma.